Fantastic figure-hugging wrap-dress with ruchings and side tie band. Slim cut, pointed neckline. Stong jersey quality, 95%polyester and 5%elastane. Lining 100%polyester. Hooks and zipper in the neck. Length approx. 98cm. Lovely detailed dress with floral embroidery and 3D applications. Figure-hugging top, feminine round neckline, broad straps and zipper in the back. Vienna seams and waist seam. Swinging skirt.Length approx. 98cm. Noble quality, 55%cotton and 45%linen. Lining 100%cotton. Strong graphic pattern and wonderful colour combinations. Flattering cut, round neckline, 3/4 long sleeves and two side pockets. Length approx. 90 - 100cm. Soft, falling quality, 100%viscose. Lining 100%polyester. Long maxi dress with colour mix and feminine silhouette. Round neckline, 3/4 long sleeves. Empire style waist. Zipper in the back. Swinging skirt. Length approx. 140cm. Lightly shimmering quality, 100%polyester. 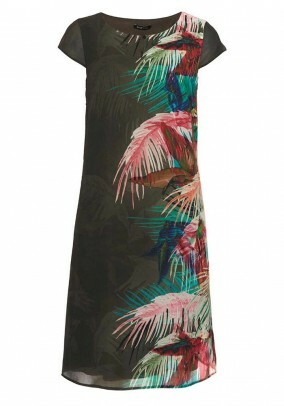 Stylish jersey dress with all over pattern print. Slim top with wrap look, feminine V-neck and side ruchings. Waist seam and tie belt. 3/4 long sleeves. Swinging skirt with metal logo badge in the front. Length approx. 89cm. Comfortable elastic jersey quality, 95%viscose and 5%elastane. Attractive jersey dress by ASHLEY BROOKE with drapings, silver coloured decorative buckle and stylish flounce trim on the skirt. Figure-hugging cut, feminine round neckline, short sleeves. Length approx. 90cm. Flowing jersey quality, 95%polyester and 5%elastane. Lining 100%polyester. Figure-hugging sheath cut with feminine V-neck and short sleeves. Decorative ornamental hems. Zipper in the back. Flattering parting seams. Length approx. 90cm. First-class lace embroidery, 85%polyamid and 15%elastane. Lining 100%polyester. A classic dress by HERMANN LANGE COLLECTION. Noble navy with wide contrasting pipings. Flattering cut, skirt with multi layers. Round neckline, oversize shoulders and slim zipper in the neck. Length approx. 101cm. Soft, flowing georgette quality, 100%polyester. Lining 100%polyester. Noble chiffon dress with layers. 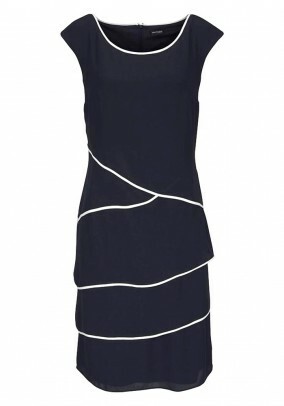 Flattering, extravagant dress with Carmen neckline. Double layer chiffon flounces. Length approx. 90cm. Side zipper. Semi transparent chiffon quality, 100%polyester. Tone in tone satin lining, 97%polyester and 3%elastane.